We wanted to make sure this experiment was SUPER sound, so we tested various styles of beer (some local, some craft, one macro, etc). The beers we used for this specific experiment were: Pabst Blue Ribbon (a standard, macro-brewed adjunct lager), Novo Brazil Brewing Co. Chula Pils (a German-style pilsener), Banded Peak’s Summit Seaker IPA, and Blindman’s Kettle Sour #1. We setup the four beers in a row, each beer paired: one dyed, one undyed for a total of 8 samples. Next, we blindfolded each participant and gave them a sample of the beer (dyed and not). 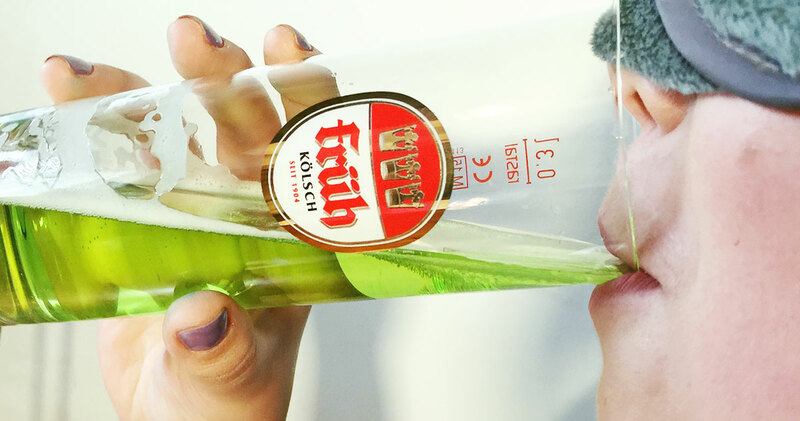 After the participant sampled the two beers, we asked them which one was the green one. We recorded answers and then continued to the next beer. It turns out the girls were able to guess the dyed beer more accurately than the guys (we assume it’s because they cheated and peeked). The guys guessed correctly/incorrectly 50/50 (which is basically random chance average). The dyed sour beer was guessed correctly 87% (7/8) of the time. For the most part, from our group of 8 people, the likelihood that a dyed beer could be determined solely by its flavour was low…unless it was the Blindman Kettle Sour which seemed to be easier to guess (perhaps the acidity affected the dye and did in fact affect the flavour, but who knows–we’re not really scientists after all). We asked participants who guessed the dyed beer correctly, how they knew it was dyed and they said they noticed a difference in texture or carbonation, but it was less to do with the actual flavour of the beer (although some may argue mouthfeel and carbonation are both components of flavour). Conclusion – Does Food Colouring Affect Your Beer? In conclusion, we feel if you have a really sharp palate you might notice the subtle difference in mouthfeel between a green/dyed beer and a regular beer. However, we’re also pretty sure if you put a bit of green dye in your beer this St. Paddy’s, you’re probably not going to destroy your beer. There’s also a good chance you’re going to have more fun (because fun people like doing festive things, like celebrating St. Patrick’s Day). 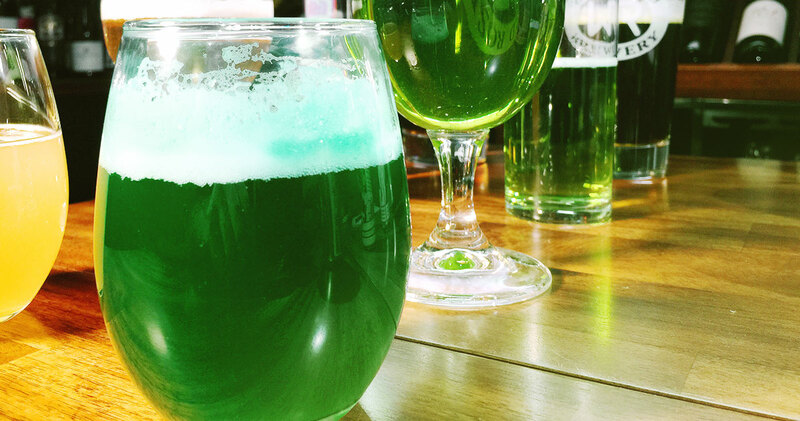 Our only caveat to the food dye and beer thing is if you plan on drinking green beer and you’re a stickler for flavour, maybe stay away from green sour beers. Green Dye and Your Health – Is Food Colouring Safe? After we shared this article, we had a few people comment about green dye being bad for your health. We dug around the web and found arguments for and against this, but none actively lead to a universal, “this is fact” answer. One article from foxnews.com implied that green dye and beer was bad for your liver, but they were referring to binge drinking specifically (no surprise here), not the dye itself. Their conclusion was still that it was safe for consumption in moderation. If you want to air on the side of caution, but you still want a green beer, there are natural options available (vegan friendly too). You can opt for green dyes like Squid Ink, Matcha Green Tea, and Chlorophyll; though we’re 100% sure the latter of those three will affect the flavour of your beer. MEME: Happy St. Patrick’s Day!